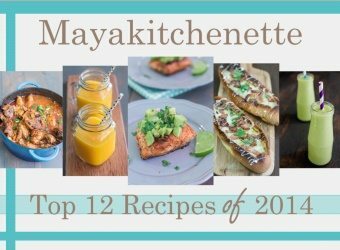 Food bloggers mostly do a meatless Monday post on Mondays. Would it be weird to post a dessert on Meatless Mondays? I don’t think so right? Dessert is always okay from Mondays—>Sundays, 12 pm—>to 12 am. Pavlova is basically a meringue cake that has a delicate, crisp crust and it is typically topped with whipped cream and fruits. I like to see the Pavlova being macaron’s elder sister. Almost all countries around the globe are fighting for power, however Australia and New Zealand are at logger-heads over something else. This dessert apparently has been a source of an argument between Australia and New Zealand as to who actually created it originally. Although is it a national dessert of Australia, yet it is widely believed that a food stylist from New Zealand was the one who created this for a ballerina named Anna Pavlova. 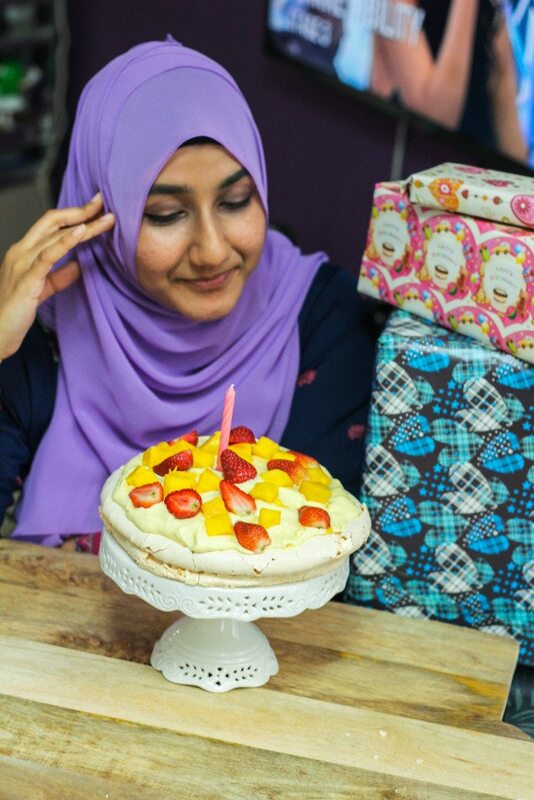 It was my BCF birthday (Read: Best Cousin Forever) and I made a Pavlova on her birthday because I wanted to serve something different. 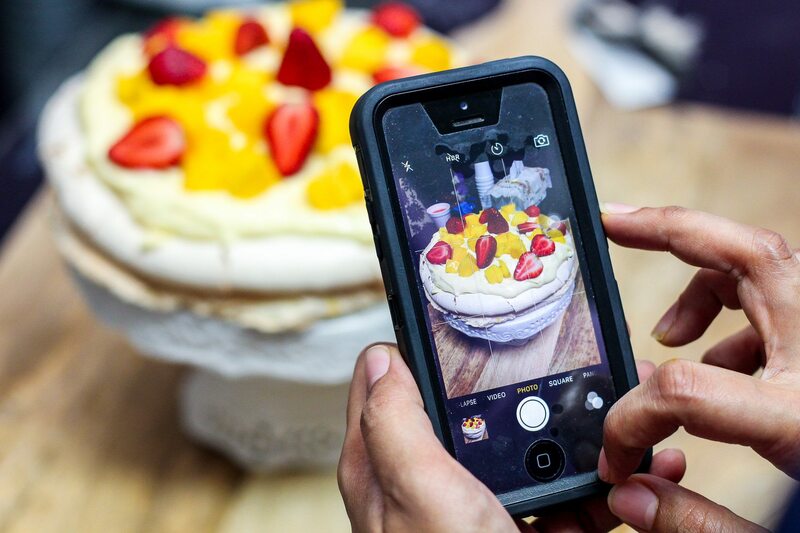 We have cakes all the time and Pavlova was a first. The initial plan was to make a white chocolate mousse to go with the Pavlova as the birthday girl is a huge fan of the white chocolate mousse that I would usually prepare every Christmas. Then again, even a white chocolate is sweet and I did not visualize the thought of topping something sweet over something sweet. Sounds a little weird I know. This lemon curd cream was absolutely delicious. It was just whipped cream + lemon curd. Perfect for topping on cakes, pies or even fruits. 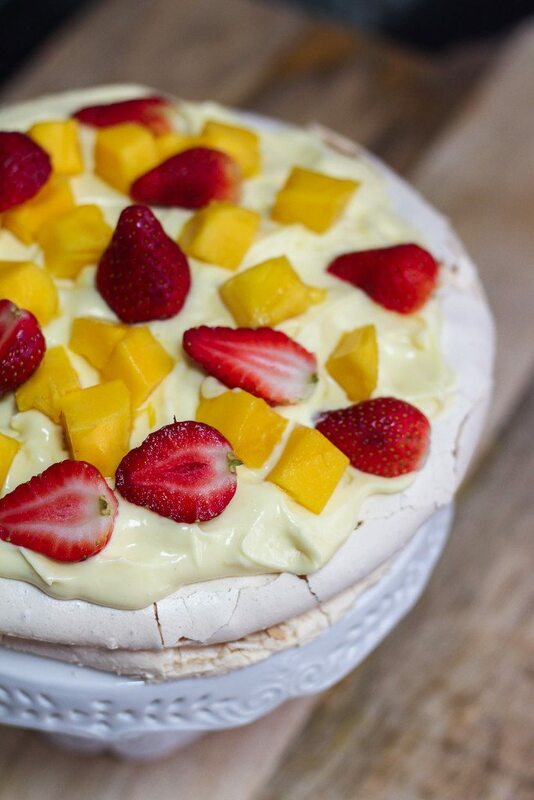 For the Pavlova, I basically topped an 8 inch disc of meringue with some lemon curd cream, fragrant mangoes and sweet strawberries and I repeated the step all over again with the second disc of meringue. 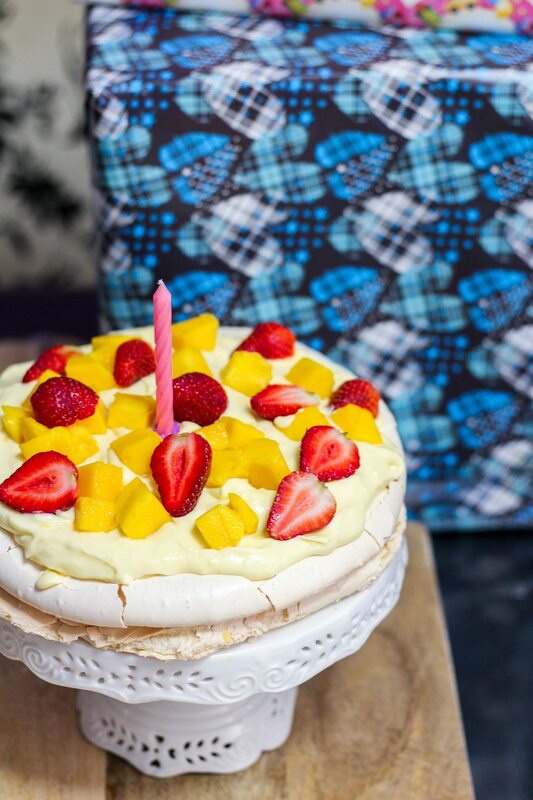 The dessert was so loved that another cousin wanted Pavlova for her birthday as well! 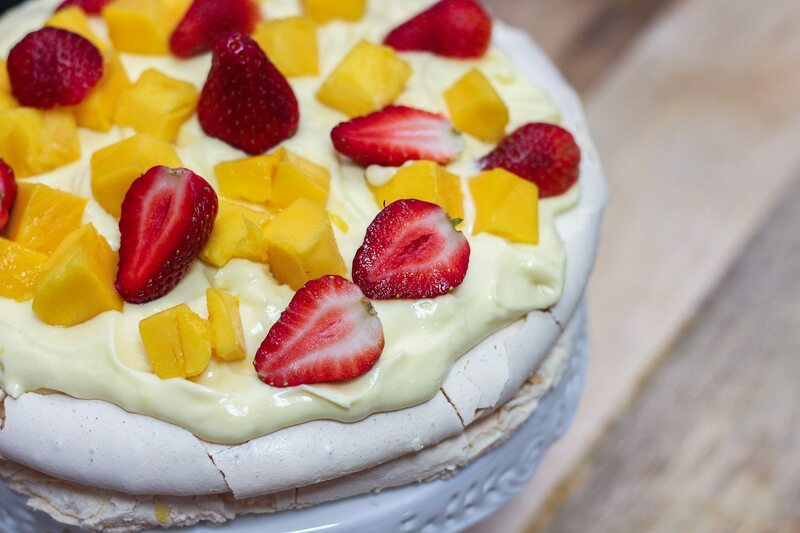 Although this is an easy dessert, it does require a bit of patience in terms of baking the Pavlova and stirring the lemon curd. All the energy that went into this Pavlova was so worth it when I saw people going for seconds, including the birthday girl. I guess I made Anna Pavlova proud! I know that a lot of people are pretty scared to prepare meringue but it is actually reasonably easy and there are 3 very basic essentials. Although optional, a stand mixer would make the process easier. In a mixing bowl, whisk the cream and gradually add the sugar. .
Increase the mixing speed until soft peaks. Add the lemon zest and whisk for a few more seconds. Gently fold in the lemon curd. Preheat oven to 300 degrees F (150 degrees C). Line a baking sheet with parchment paper. Draw 2 8-inch circles on parchment paper. In a large bowl, beat egg whites until stiff. Gradually add in the sugar, about 1 tablespoon at a time, beating well after each addition. Beat until thick and glossy. Gently fold in vanilla extract, lemon juice, salt and cornstarch. Spoon mixture inside the circles drawn on the parchment paper. This should leave a slight depression in the center. Once cool, remove the paper, and place one meringue on a flat serving plate. Fill the center with the lemon curd cream, top with strawberry halves and cubes of mango. Repeat the same with the second layer.